Kampala, July 19 (The New Vision) — The Uganda Co-operative Alliance has warned microfinance institutions against investing much in constructing multi-million houses, saying this was not part of their duty. "I did not come here only to say what you want to hear but also to advise you on what you ought to do," he said. Addressing members of the Kakuuto Microfinance Savings and Credit Society at Kakuuto county headquarters at their general annual meeting, he explained that investing in capital development would be wastage of funds. Muwumba explained that it would be absurd for a member to go to the institution to withdraw or borrow money only to be told there is no money because it was used to put up a building. Muwumba was reacting to claims that the institutions had invested about sh120m to build a house at Kakuuto yet they did not even have a land title or consult the landlord. "If banking institutions were meant to invest in such buildings, the big banks like Centenary, dfcu and others would be boasting of owning the tallest buildings in Kampala, but even Stanbic sold off the UCB building," Muwumba explained. He advised members to delay the construction of their building and lend the money to the members. Kakuuto MP Mathias Kasamba said the Kabaka of Buganda supported development on his land and had to be consulted before construction could begin. The LC5 chairperson Vincent Semakula, expressed concern over the absence of Bonna Bagaggawale funds in the microfinance, which he said was the most organised among all microfinance institutions in the district. Army MP Maj. Gen. Julius Oketa, who represented the chief of defence forces, Gen. Aronda Nyakairima, handed over a donation of sh2m to Kakuuto Microfinance. 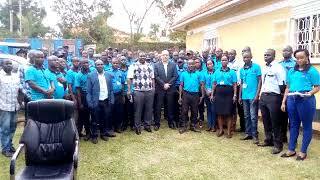 Water and environment minister Maria Mutagamba, Rakai district chairman Vincent Semakula, Mathias Kasamba (Kakuuto MP) and Gordon Wavamunno of WBS, are some of the members of Kakuuto Microfinance Savings and Credit Society.